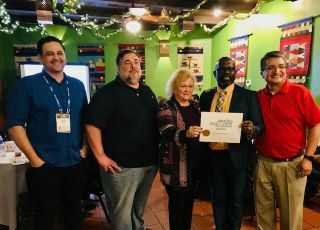 At a special reception at the TCEA conference in San Antonio, Tech & Learning announced the winners of the TCEA Best of Show awards, as well as the top three winners of the Awards of Excellence Contest. Dr Royce Avery, superintendent of Manor Independent School District, accepts the award for Awards of Excellence finalist Mindplay Literacy. Click here to read more about the Awards of Excellence Finalists and Honorable Mention winners. More details about these winning products will be included in the March issue of Tech & Learning.